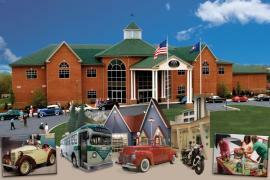 Home / Things to Do / History & Heritage / AACA Museum, Inc.
Cruise through time from the 1890's to the 1980's with cars, buses, trucks, motorcycles and other memorabilia in unique period themed scenes! Our interactive kids area and changing exhibits make this a great destination for all ages and interests. Open daily, year round. Description: Catering by preferred list, AV by rental and free internet access available for meetings. Get $1.00 off admission for up to six guests when visiting at the same time.